What are Canker Sores and Can They be Prevented? If you have ever experienced a canker – or chancre – sore in your mouth, you know that they can be bothersome at the very least, and often quite painful. They seem to pop up out of the blue and immediately outstay their welcome. So, what are they exactly, and is there anything you can do to get rid of them? Read on to discover everything you need to know about canker sores. Canker sore is the informal term used in North America for the medical condition referred to as Aphthous Stomatitis. Canker sores are generally small ulcers found only inside the mouth, usually along the cheeks, tongue, or lips. They can make it very uncomfortable to talk, eat, or drink and can be very painful when acidic foods come into contact with them. The flesh of the sore itself is usually white and very tender with red aggravated skin surrounding it, but they are not contagious. Who do canker sores affect? Women are twice as likely to get canker sores than men and usually occur between the ages of 10 and 20, although they can appear earlier in life. That being said, anyone can be affected by canker sores at any age. There have been cases of canker sores reported as early as two years old. Unfortunately, the true cause of canker sores is unknown. However, it has been proven that eating an excess of highly citrus fruits, such as lemons, oranges, pineapples, tomatoes, and strawberries, can trigger canker sores in many people. Consuming a lot of sugary foods, such as candies, can also cause sores to pop up. Damage or irritation from dental appliances, accidental biting of the tongue or cheek, or ill-fitting dentures can also be a trigger for canker sores. There has also been evidence that suggests a diet lacking in vitamin B-12 can cause canker sores. This vitamin can be found in foods such as eggs, dairy products, and seafood. Canker sores occur exclusively inside the mouth and do not have any known cause. Cold sores, on the other hand, are caused by a viral infection and are highly contagious. 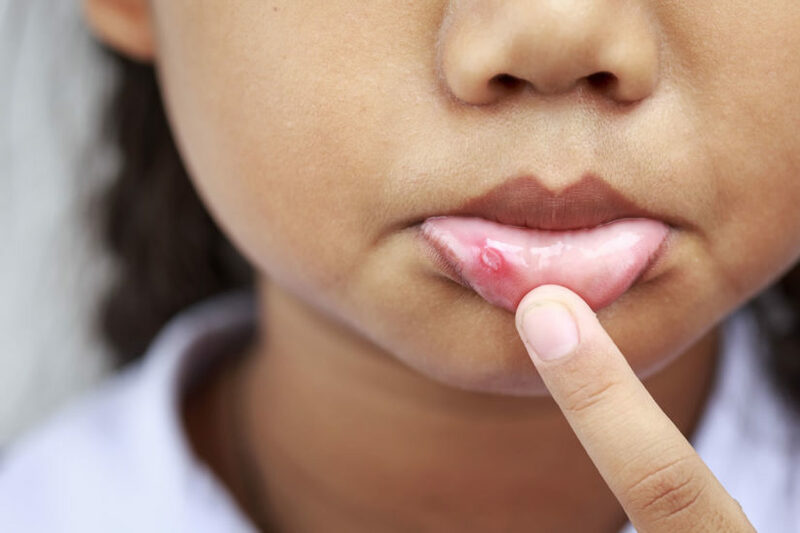 Unlike canker sores, cold sores occur outside of the mouth and are filled with fluid, resembling blisters, and generally scab over before healing. Generally, no, canker sores are not dangerous. They can be extremely uncomfortable, even very painful, but they usually disappear on their own after a week or two. However, canker sores should not occur more than four or five times in a year – so if you experience an excessive amount, it could point to a larger health issue. Consult your doctor if you believe this sounds like your experience. Most of the time canker sores are best treated by leaving them alone until they disappear in a week or so. Canker sores can also be laser treated by your dentist which provides immediate relief and quicker healing time. If you are bothered by canker sores regularly, your dentist may recommend that you use a canker sore combating mouthwash. Avoiding trigger foods, such as highly citrus fruits and extremely sugary treats, is essential when letting your canker sore heal as exposing it to these foods can further aggravate it. Being careful when using dental appliances such as retainers, dentures, and braces, is important to ensure further damage isn’t done to the affected area. Be sure to thoroughly brush your teeth after meals to ensure that food particles or bacteria doesn’t get attached to the sore and possibly cause an infection. If your canker sore does not improve on it’s own after two weeks, consult your dentist or doctor for further diagnosis. There are also many home remedies which can be used to treat canker sores. Because the exact causes of canker sores are not known, it is difficult to prevent them aside from avoiding foods and physical irritations that might trigger a canker sore. Ensuring that you don’t have an allergy that could trigger canker sores and including enough vitamin B-12 in your diet are great steps to take in preventing future a breakout. Always be sure to clean your mouth properly at least twice each day and visit your dentist regularly for checkups and oral health monitoring.